Cody Coffee opened its doors in 2016. Located near some of the most scenic vistas in the country, this one is a great coffee for those rough Wyoming Winters. The coffee is a single origin from Guatemala, and of course we were excited to try it, since we haven’t reviewed many coffees from this Central American country. This coffee was a dark roast, that many people would know as a French Roast. This roast was probably too dark for an espresso, but that’s what we do, we review the coffees as both an espresso an pour over coffee. It had a dark initial taste but was actually quite smooth throughout for an espresso. A nice body and some cream with no bitterness. As a pour over coffee it was smooth and dark, but it had a nice creamy light quality to it as well. When a coffee is this dark it loses much of the fruit or floral notes, so what many dark roast drinkers want is a full rich cup. This is one of the best dark roasts we’ve had, and we enjoyed its boldness especially during the cold January mornings. 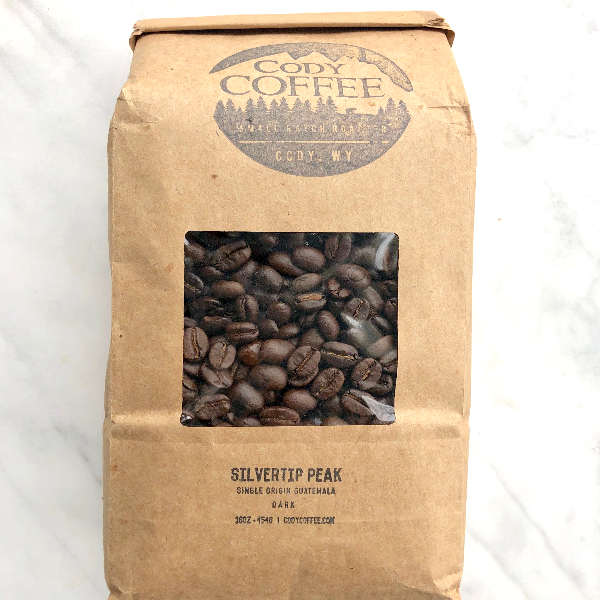 If you like dark coffees, the Silvertip peak roast from Cody Coffee would certainly appeal to you. We’ll have another coffee from Cody coming up soon, so make sure you check back again. Special thanks to Jesse from Cody Coffee for all the coffee, visit them at www.CodyCoffee.com.